People added to the bugs. Also behind is FR van 6 bought at Walton. 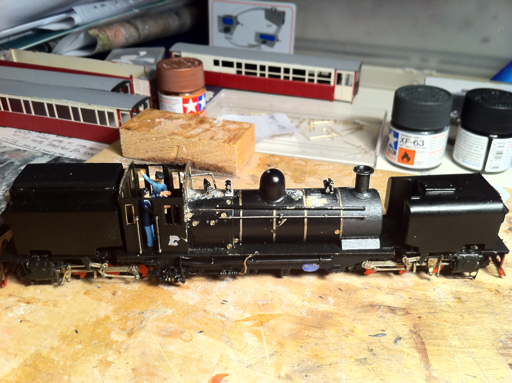 It just needs painting green and then is ready to go as it's glazed and sports nice couplings. Well I said I wasn't going to touch 143's boiler details. Well that lasted one day before I decided to alter them. Frankly with the lovely NG143 plates coming I felt it would be disingenuous to add them to a loco that bore only a passing resemblance to the real thing. The parts have been moved to their correct positions and once they have set I will add replacement piping. Washout plugs have been added and even a crew added. Other areas that have been worked on have included the headlights and a mix of gunmetal/black for the smokebox. 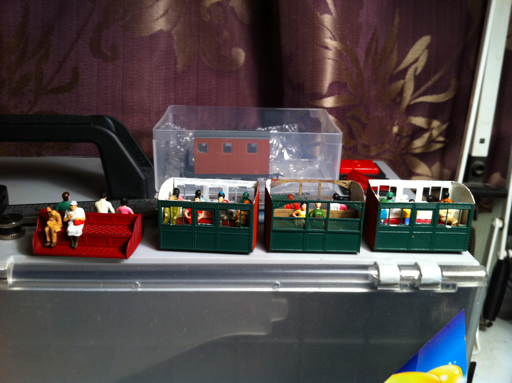 Dad has also painted the buffet car, which is really coming together, when married to the interior I built. and fabricating endless sets of handrails for the saloons… I am 3 short as I lent too much nickel silver wire to Dad! and have been working on 143 to make her more like the real one – oil tank in bunker, steam pipe covers, copper not black piping, handrails finishing half way across the smokebox etc. There are however a couple of serious differences which will not be able to be sorted before expoNG. For example the whistle, top feed, steam turret and safety valves are all (yes ALL) in the wrong place on the boiler. Whoever made this I suspect has soldered them on and thus removal to their correct positions would be a major job, necessitating repainting and a whole load of re-piping. Too much before expoNG – sorry to all crazy rivet counters! A number of carriages have also been painted, including the bugs which are now ivory inside with red cushions and people are about to be added inside too. Custom nameplates in 009, 7mm or even 16mm - http://www.narrowplanet.co.uk/ – now here are proper NGG16 nameplates – far and away better than the poor generic plates included in the backwoods kits. Do have a look and give Steve an email/call – top guy, top service! Some more painting of carriages today – the bugs are looking good with the green/red done and the interiors in wood colour… 117 has progressed from primer, right through to red/ivory with black ends and the Pickering I built is nopw grey with black details. The other two carriages are refurbs from the late Ben Fisher’s collection – the NWNGR workmens carr, now with interior fitted and another Pickering brake in green. Bit of a session tonight…. Bikes in bike wagons finished off, loads added for other B wagons and Gelert got a coat of matt black and red (why does red cover so poorly? gonna need about 8 coats at this rate!). The 66 is Thomas’, in the works for repairs. I also started drilling out the holes for handrails on the WHR saloons – what a job that’s going to be! Successfully did about 20 and then gave up for the night. The Romanian carriage 2060 has come on massively with lots of extra details added by Dad's steady hand - silver around the windows, red around the doors etc. Finally Dad and I spent ages (Dad for considerably longer whilst I played tennis with my brother) sorting out the red lines on all the WHR carrs so that they can be finally glazed. Carr 22 was glazed as a test for the glue - GS hypo cement works perfectly! Wiring is done (save for the LED point indicator which I can’t do as I lent Dad all my LEDs!). To save time, I checked the polarity with croc clips before soldering on, saving any resoldering later! I really do like tortoises as they are so easy to setup and can be tweaked easily too. The only problem with them is their depth, which exceeds that of my baseboard framework. So, to avoid damage to the bottom of the tortoises, I made up 4 little pads which will hit the ground before the tortoise does, thus saving them. These are being glued/nailed in place as per the image below… They will be invisible on the finished layout as the curtain covers them. It’s just about lunchtime and I’m pleased to report that all 4 tortoises are nearing completion. 1 has been tested, and despite the frog polarity being wrong, works perfectly. [why is it always the case that you wire them up the wrong way round??]. The other 3 have had their inputs from the lenz accy decoder added, rectified by diodes. These have been tested and also work fine. Now it just remains to sort out the frog polarity feeds and on one of the motors, the LED point indicator. If you’re wondering why I’m modelling today, this is because I am currently on gardening leave having resigned from my job yesterday. It’s yet to be confirmed, but I may possibly have 3 months of this – plenty of modelling time! painting of track is nearly complete and so the tortoises have been screwed in under the baseboard. wiring will commence today. In other news I am building the cycle stands for the B wagon (bike wagon) from some evergreen strip and have already sourced some bikes. I camped at Llyn Cwellyn, here’s the view when I opened the tent in the morning! I walked miles! Up to the top of Bryn Du from Bron Hebog (the farm) is a memorable climb! and of course plenty of opportunity to get up close and personal with various items of rolling stock to check out details and liveries, but I won’t bore you with that on here (yet).